Staff stand within the United States embassy facility in Havana, Cuba on Sept. 29, 2017.Staff stand within the United States embassy facility in Havana, Cuba on Sept. 29, 2017. A communications breakdown within the State Department delayed by more than half a year the creation of a special panel to assess the response to mysterious health "attacks" on U.S. diplomats that led to brain injury, according to report from congressional investigators obtained by NBC News. The Government Accountability Office report, which has not been publicly released, determined that the unit of the State Department responsible for setting up the special panel first learned of the incidents from reports in the media in August 2017. 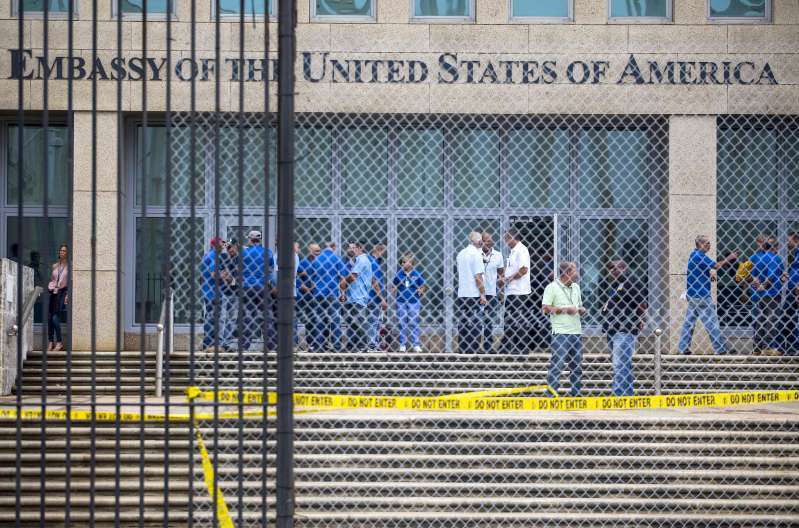 That was eight months after medical staff at the U.S. Embassy in Havana started evaluating U.S. government workers who reported incidents. The State Department's medical unit, Western Hemisphere Affairs bureau and Diplomatic Security service were all aware of what was happening but failed to inform the State Department management office responsible for initiating the establishment of an Accountability Review Board. In the meantime, 80 workers were medically evaluated and 16 found to have brain injuries. More were discovered later, including after new incidents were reported. By law, the board must be set up within 60 days of an incident that seriously injures a diplomat abroad. Its mandate is to look into whether the government responded appropriately. Examples of past high-profile review boards include the one that investigated the U.S. response to the attacks in 2012 attack in Benghazi, Libya, that killed four Americans. Congressional investigators determined that the State Department currently has "no policy" in place to ensure that information flows to the management office that starts the process of setting up the board. The State Department agreed with that conclusion and pledged to make improvements, the GAO report said. The State Department declined to comment because the congressional report hasn't been made public. The new report comes as concern about the incidents, deemed "specific attacks" by the State Department, has increased after a U.S. diplomat working in China was determined to have also been injured by a similar phenomenon and developed brain injury. "Improving its security programs at U.S. diplomatic posts is all the more imperative given recent reports of similar incidents, such as in Guangzhou, China," the report said, referring to the State Department. Ultimately, the accountability review board for Cuba was established in January 2018 — more than a year after the incidents started. In a summary of its findings released last week, the board determined that no State Department workers acted improperly, but identified similar problems with internal communication, as well as unfilled security positions and a lack of sufficient planning for the diplomats' long-term care. The delays in fully responding to the incidents are expected to be a focus on Thursday when State Department officials testify before the House Foreign Affairs Committee's subcommittee for the Western Hemisphere. Rep. Paul Cook, R-Calif., who chairs the Western Hemisphere panel, said the report illustrated how "policy, procedure, process, and communications issues prevented a more effective State Department response." GOP Rep. Ileana Ros-Lehtinen of Florida, a staunch critic of Cuba's government who requested the congressional report, said the communications breakdown also significantly delayed the State Department in raising the incidents with the Cuban government. "The truth about these incidents will come to light and the United States stands ready to hold accountable those responsible for attacking our citizens," Ros-Lehtinen said. Bizarre sounds heard by the workers initially led investigators to suspect a sonic weapon, although signs now point to a microwave device or electromagnetic waves as the likely cause, NBC News has reported. The congressional report says that as of June, when the report was being written, "State officials remained uncertain of the cause or perpetrator of the incidents and injuries."